I’m really excited to be sharing with you today the cover of the next book in Paula Harrison’s ‘Robyn Silver’ series. I am a big fan of the action packed, ‘Robyn Silver The Midnight Chimes’ which is a wonderful tale stuffed full of monsters and adventure. 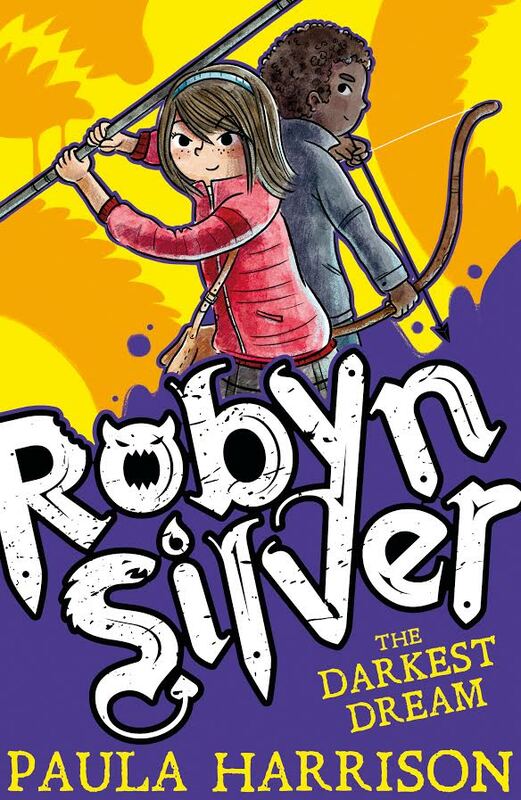 So I can’t wait to go on another thrilling ride with Robyn, Aiden and Nora in ‘Robyn Silver: The Darkest Dream’ which will be published on the 6th July by Scholastic. So without further ado here it is……. I love this brilliantly, bold cover designed by Jamie Gregory and illustrated by Renée Kurilla I think it will really stand out on the shelf and demand to be read. Featuring Robyn and Aiden side by side it hints at the danger and drama that lies beneath the cover. I am very pleased to hear that Nora will be on the back reading a book, because we all know that books are filled with the right kind of knowledge to help defeat menacing monsters. The boldest, brightest new heroine is back: and Robyn Silver’s life hasn’t got any quieter since defeating the evil vampire Pearl in The Midnight Chimes. She’s now a fully fledged Chime Child and monster-hunter-in-training alongside best friends Aiden and Nora. The three suddenly start seeing nightmares – in the form of black beetles – appear around town. Who wants the people of Grimdean to be losing sleep – and why? Paula Harrison is a best-selling children’s author who has sold more than a million books worldwide. 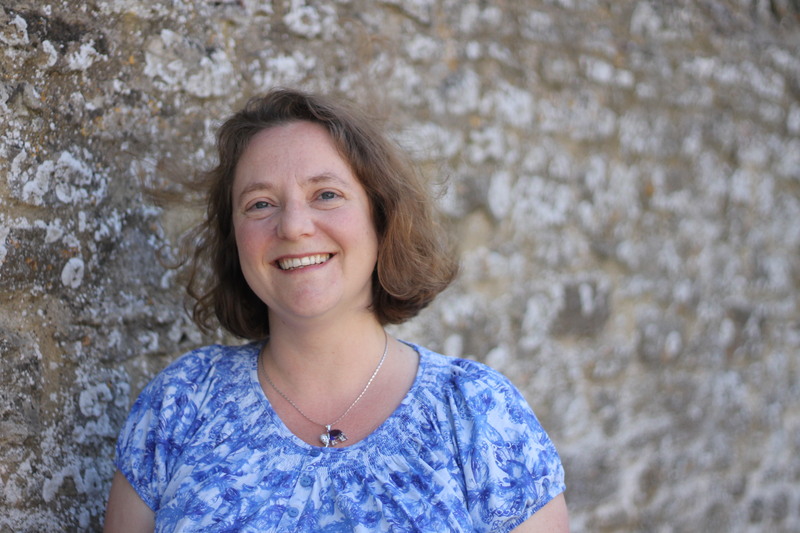 Her books include Robyn Silver: The Midnight Chimes, the Red Moon Rising trilogy, The Secret Rescuers series and The Rescue Princesses. She wanted to be a writer from a young age but spent many happy years being a primary school teacher first. She lives in Bletchley with her husband, children and two black cats. Thank you to Paula and Scholastic for inviting me to host the cover reveal. This entry was posted in Uncategorized on March 29, 2017 by bookloverjo. 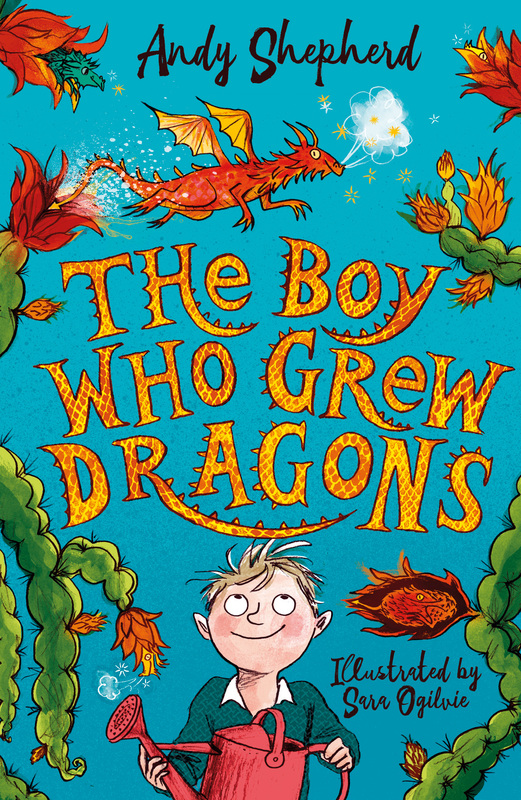 I’m really excited to be able to reveal for you today, the cover of the lovely and talented Andy Shepherd’s debut novel ‘The Boy Who Grew Dragons’, which will be published in Summer 2018 by Piccadily Press. This stunning cover is Illustrated by the award-winning Sara Ogilvie, one of my most favourite illustrators I’m a huge fan of her picture books. For me it hints at the magic, warmth and wonder that lies underneath this cover. ‘The Boy Who Grew Dragons’* will feature illustrations throughout the book from Sara, which is lovely news as I absolutely love illustrated fiction. This three-book illustrated fiction series for 7-9 year olds, ‘The Boy Who Grew Dragons’, ‘The Boy Who Lived With Dragons’ and ‘The Boy Who Flew With Dragons’ will be published in 2018 and 2019. It follows Tomas, a young boy who discovers dragons growing at the bottom of his grandfather’s garden. Andy Shepherd is a children’s writer working on middle-grade fiction and picture books. She lives near St.Ives – the Fennish one, not the coastal one – with her husband, two young sons and their border collie, Poppy. Growing up on the Essex Coast she spent most of her time scribbling stories and messing about in boats. Her main ambition is to figure out how to move Cambridge closer to the sea. Thank you to Andy and Piccadily Press for inviting me to host the cover reveal, I can’t wait to get my hands on a copy of ‘The Boy Who Grew Dragons’. This entry was posted in Uncategorized on March 27, 2017 by bookloverjo. 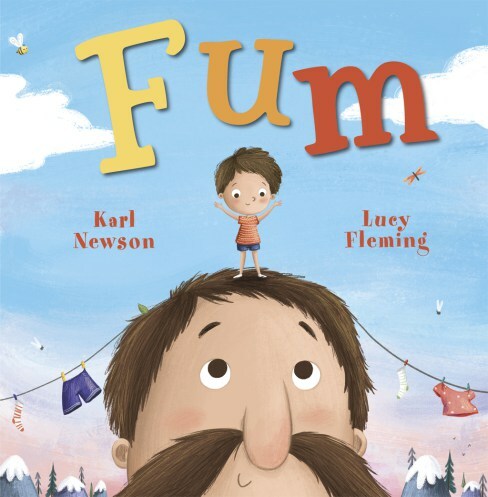 It was with much anticipation that I got my hands on a copy of ‘Fum’ by Karl Newson and Lucy Fleming. I’m a fan of Karl’s fabulous ‘Mudwaffler’ picture book blog and have always admired Lucy’s gorgeous illustrations since I first spotted them on the Colour Collective on Twitter. 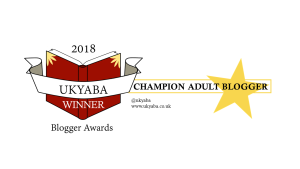 In awe of Lucy’s talent I asked her to create my stunning blog banner which fills me with joy every time I look at it. So I was really excited to see what this wonderful collaboration had produced and after reading ‘Fum’ I was not disappointed. 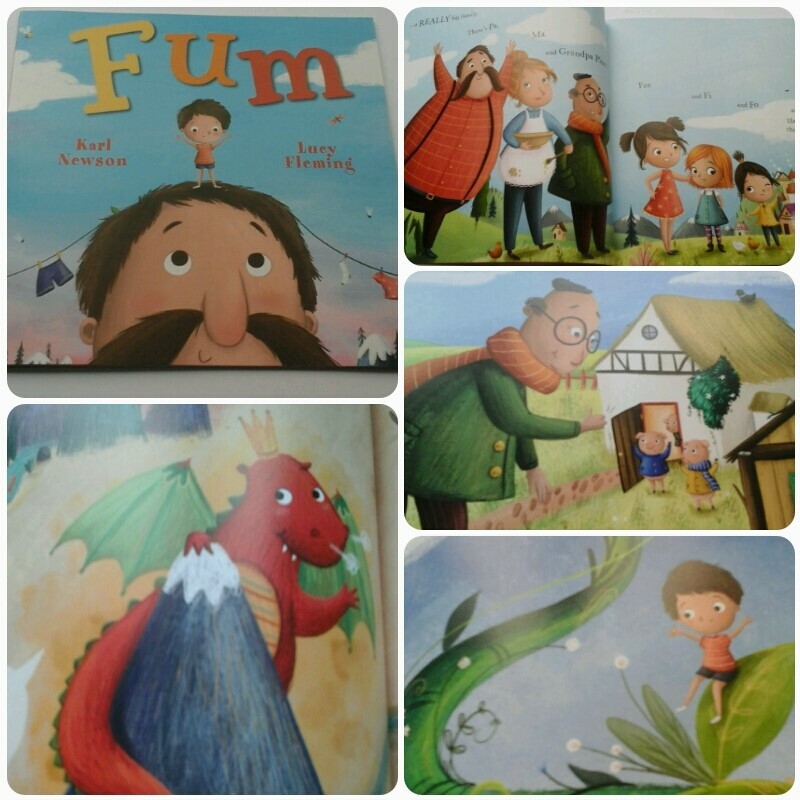 ‘Fum’ tells the tale of the Crumb family, a family of giants who one day manage to lose the smallest Crumb, Fum. We get swept off on an adventure through a land of fairy- tales as we go on a hunt for Fum, across mountains, through forests meeting a dragon, a talking frog and a princess on the way. As soon as I read this story I knew that this was a book that demanded to be read aloud and I took it into school and shared it a storytime. The reaction from the children was amazing, they took huge delight in shouting out where ‘Fum’ was hiding, believing me when I said that, just like the Crumb family I couldn’t see him anywhere. I have never heard so much noise and laughter in the library it was a real joy to see. The rambunctious rhymes made it delightful to read and gave me a fantastic opportunity to put my storytelling skills to the test. Lucy’s vibrant and colourful illustrations are filled with the most glorious details offering children the chance to pour over the pages to discover all the different fairy-tale stories within the book. This book would be perfect to use in school within an early years setting as an introduction to fairy-tales, acting as a fantastic spark. Warm and witty,a this proves to be an irresistible combination of a lively and fun story filled with the most splendid illustrations. Thank you to Maverick Books for sending me a copy of this wonderful book. This entry was posted in Uncategorized on March 26, 2017 by bookloverjo. After devouring the fabulous ‘Swimming to the Moon’ by Jane Elson in one sitting, I was eager to get my hands on another of her books. Constantly on loan in my school library the chances of me getting to read one of Jane’s books from there was incredibly slim. 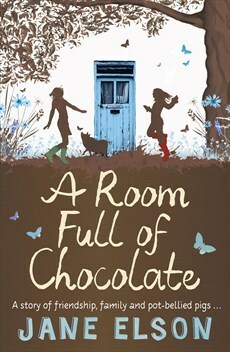 So when our lovely local indie bookshop P & G Wells visited out school for a book fair in World Book Day week I decided to treat myself to a copy of ‘A Room Full of Chocolate’ and I am so glad that I did. I was planning to save it for the Easter holidays but the lure of this book was irresistible and I find myself grabbing it from my ‘to be read’ pile knowing that Jane’s exquisite storytelling was exactly what I needed on that day. When Grace is sent to live with her estranged Granddad while her mum goes into hospital it turns her life upside down and not for the better. Forced to move school and leave her friends behind, the thought of being sent to the middle of nowhere with a Granddad she doesn’t know fills Grace with horror. Soon Grace misses her mum so much it hurts – not even chocolate makes her feel better. But when she befriends the effervescent Megan and her naughty pig Claude, a small ray of hope enters her life giving her the courage to face whatever may lie ahead. This truly magical story about the power of friendship in the darkest of times is just beautiful. An empathetic and moving read, it explores the difficulties Grace, her Mum and her Granddad feel when fate deals them a horrible blow. 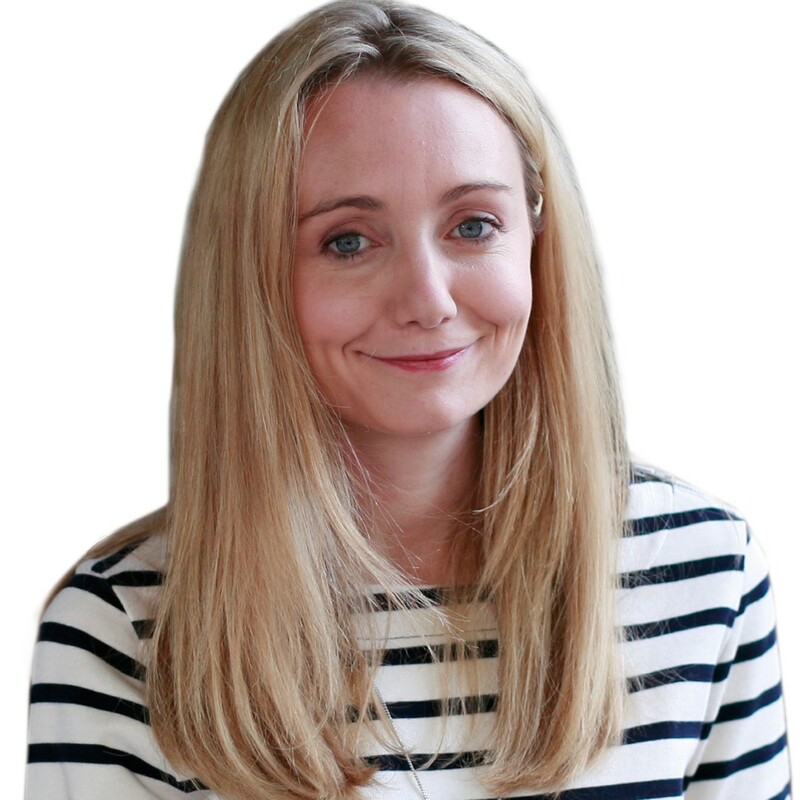 Kept in the dark about her Mum’s illness Grace struggles to make sense of the world around her, confused and lonely, her pain at not knowing what is going on radiates through the pages. It is her friendship with Megan that saves her, giving her the strength and she needs to survive without her Mum . The bond between them is strengthened by the knowledge that their Mums were the very best of friends and brings comfort to Grace. Jane really gets to the heart of her characters allowing the readers to really feel their raw emotions and internal struggles, taking you along on this emotional journey with them. Wonderfully compelling you can’t help but find yourself caught up in Grace’s life, wishing her a happy ending despite the difficult circumstances. It made me laugh, cry and delight in equal measures, I can’t recommend it enough another brilliant novel from Jane Elson. I’m a huge fan of funny books, for me I just can’t get enough to satisfy my need for laughter. I actively seek books that are genuinely hilarious, that make me laugh out loud and inwardly cringe. Thankfully ‘Alex Sparrow and the Really Big Stink’ delivers both of these in equal measures. Meet Alex Sparrow a super-agent in training, who has been on a mission since he was 4 years old to be an undercover, super spy by undertaking an extreme regime of mental and physical activities. Well that may just be a slight stretch of the truth! Okay it is in fact a ginormous lie! I’m not sure doing a hundred star jumps a day and chasing the mangy cat from next door out of your back garden quite fits that description but nevertheless Alex is adamant that he has what it takes to be a real life super agent. Unwittingly Alex’s conviction is tested when he acquires a unexpected and very smelly superpower which he must use to get to the bottom of some very unusual happenings at his school. Together with Jess – who can communicate with animals – they must find out why their friends – and enemies – are all changing into polite and well behaved pupils. And work out exactly who is behind it all. Stuffed full of humour, mystery and the unexpected, this hilarious adventure is a laugh out loud extravaganza of a read. Alex and Jess make a formidable duo, who despite finding each other less than endearing are forced into an unlikely partnership to save their school from impending doom. 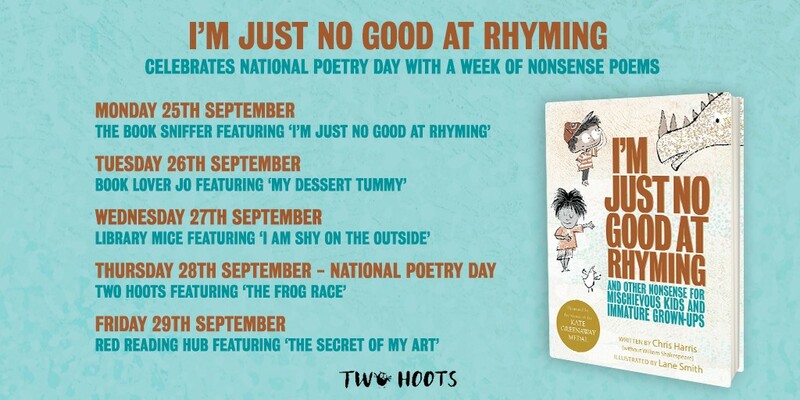 For me it is the subtle humour scattered throughout the book that is a real triumph, making me chuckle the most. I love how Alex is so caught up in his secret-agent persona he likes to narrate the action unfolding – in his best secret-agent voice – even if this means he might blow their cover. Jess (or Jessticles as Alex likes to call her) is an absolute gem of a character. Moody, fierce and downright fearsome she refuses to be Alex’s sidekick, she won’t take any nonsense from Alex and their relentless bickering is a total joy. Underlying this cracking plot we have a story that celebrates the importance of being unique and different, highlighting how disturbing it would be to live in a world (or in this case a school) full of children conforming and being the same. Alex learns the hard way how so called ‘friends’ can let you down in your time of need and that friendship can be found in the most surprising of places. Packed to the gunnels with brilliant, comic moments – my favourite involves Bob, Alex’s rather remarkable goldfish and a can of energy drink. 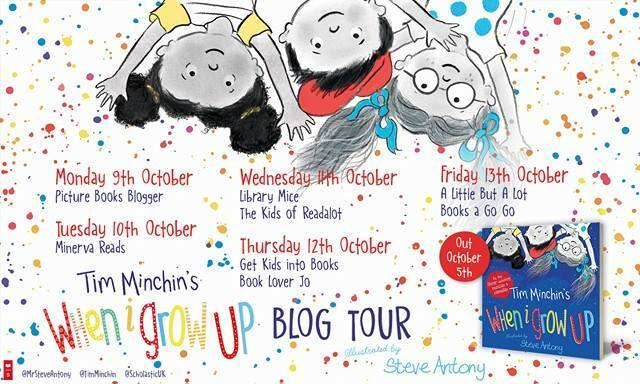 – ‘Alex Sparrow’ is an irresistible combination of humour and heart. 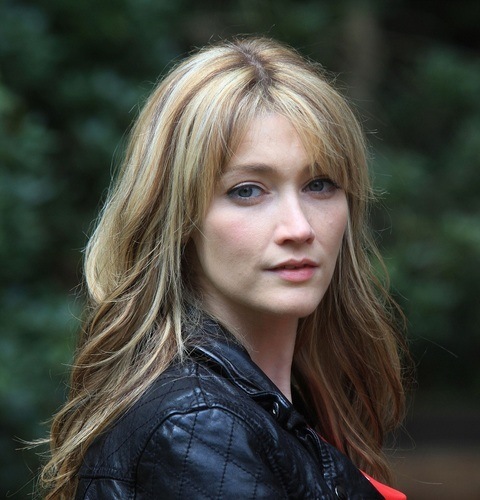 A truly impressive debut, Jennifer Killick is definitely one to watch out for. 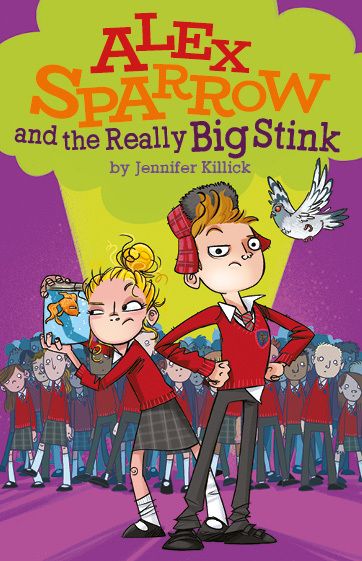 Jennifer Killick has always wanted to be a writer, but really started when she applied for a Creative Writing MA at Brunel University, which is where she first got the idea for ‘The Really Big Stink’. She lives in Uxbridge, in a house full of children, animals and Lego. When she isn’t busy mothering or step-mothering (which isn’t often) she loves to read, write and run, as fast as she can. 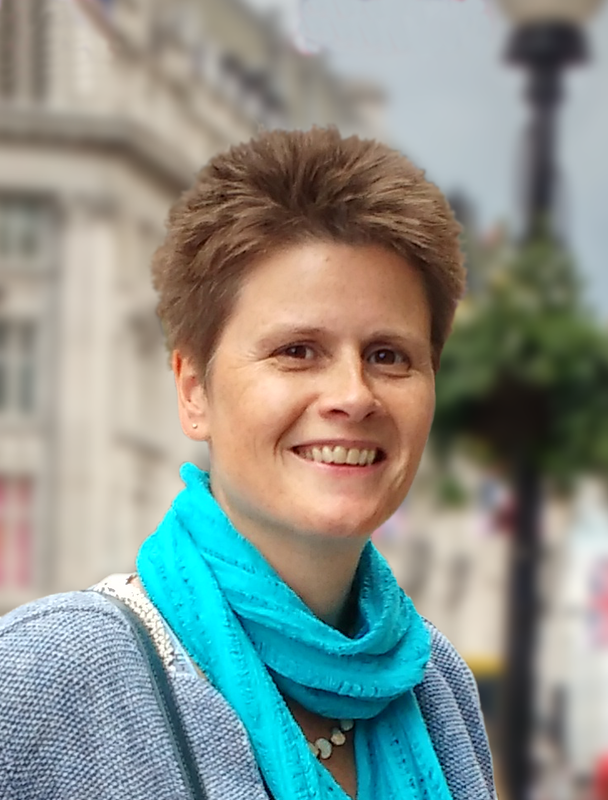 Jennifer’s favourite things are books, trees and fluffy slippers, and her favourite place in the world is her home, where she can sit in her pyjamas with tea and cake, coming up with story ideas. Thank you to Firefly Press for sending me a copy of this hilarious book. This entry was posted in Uncategorized on March 23, 2017 by bookloverjo. Today it’s my stop on the ‘Harper and the Night Forest’ blog tour with a review of this glorious book by Cerrie Burnell with illustrations by Laura Ellen Anderson. This happens to be my favourite ‘Harper’ book in the series because it captures the power of storytelling and the magic of fairy-tales beautifully . Harper and her friends are taken on another whirlwind adventure when they agree to help the Wild Conductor capture the enchanted Ice Raven. Determined to win his place back in the Circus of Dreams, he will stop at nothing to capture this mythical bird. When the children enter the forest they soon begin to discover that there are secrets hidden in these mysterious woods. Before long they realise the terrible consequences that would happen if the Ice Raven left the enchanted Night Forest for ever. Can they stop the Wild Conductor before it’s too late? With wonderful characterisation and exquisite storytelling, Cerrie takes you on a journey to fantastical world where you discover fairy-tale keepers and an haunting unfinished fairy-tale of the Ice Raven and the Lone Wolf which is filled with sadness and loneliness. I love the incredible attention to detail that she uses to creates this magical world filled with clocks marking the moments fairy-tales began, a cottage filled with objects straight out of fairy-tales – including a red cloak made of the same material as Harper’s umbrella – and stories carved into trees to keep them alive. Filled with the most interesting characters that give the story a richness and depth. Liesel is my absolute favourite, her obsession with fairy-tales and longing to be part of one is just delightful. I love how she has no fear of falling down a chimney of a witch’s cottage or is thrilled to stumble upon a wolf in the forest, feeling disappointment when she realises it’s the enchanted prince. 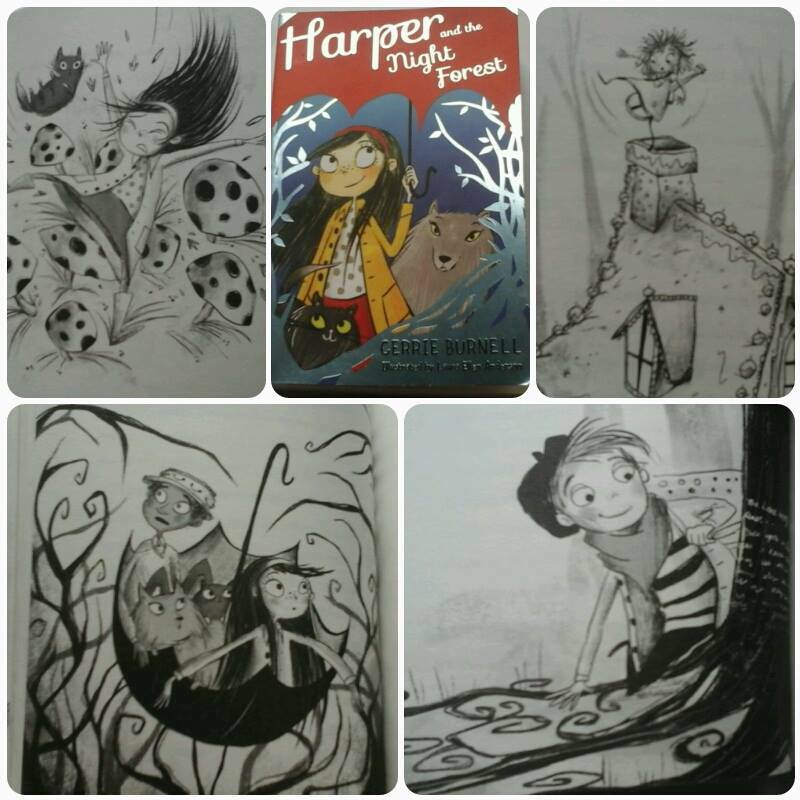 Laura’s illustrations are just divine capturing the spirit and excitement of the adventure that Harper and her friends find themselves in. I can imagine it must be incredibly challenging to capture such extraordinary objects as a ‘cloudian’ but Laura does this brilliantly. This is a truly irresistible tale filled with magic and wonder, if you haven’t discovered Harper and her friends why not join them on this marvellous adventure. When she’s not trying to take over the world or fighting sock-stealing monsters, Laura Ellen Anderson is a professional children’s book author & illustrator, with an increasing addiction to coffee. She spends every waking hour creating & drawing and would quite like to live on the Moon when humans finally make it possible. 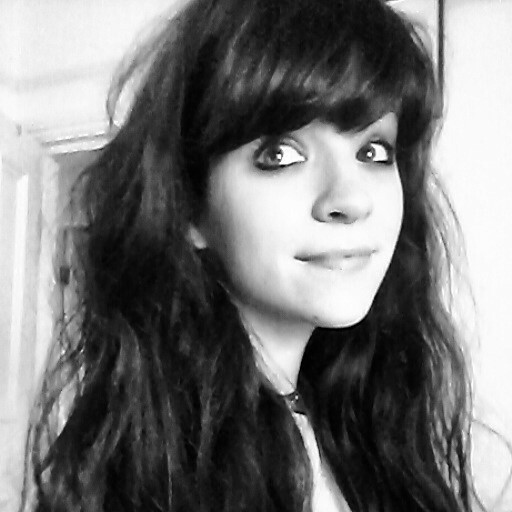 You can find out more by following Laura on Twitter @Lillustrator or visiting her website. 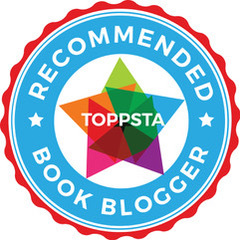 Thank you to Faye and Scholastic for inviting me to join this blog tour and for sending me a copy of this truly special book. 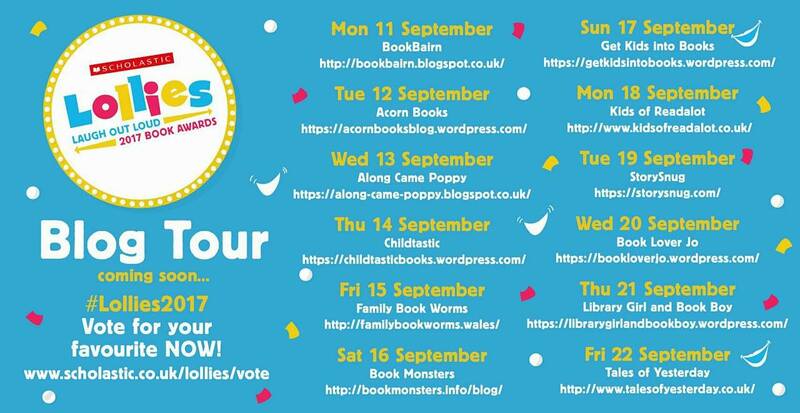 You can join in with the rest of the blog tour for more reviews and giveaways. This entry was posted in Uncategorized on March 21, 2017 by bookloverjo. 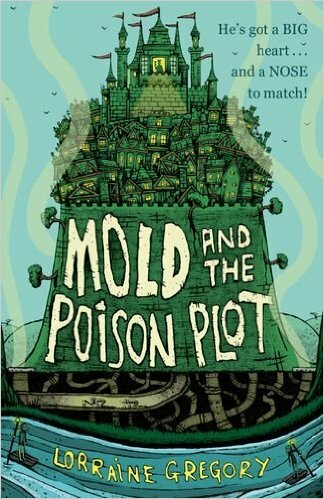 Lorraine Gregory’s debut ‘Mold and the Poison Plot’ is an absolute joy to read, filled with so much humour, bravery and heart, that you can’t help being enchanted by this magical tale. Meet Mold, a boy who was dumped by his Mum in a dustbin as a baby. An unusual boy who even the binmen didn’t want, not being fair enough to sell at the rag market with his scraggy hair and huge nose. Luckily for him, old Aggy found him at the dump and took him under her wing. She harnesses his special gift of smell to find customers that need help, who he then sends to Aggy who sells them potions to remedy their ails. One day Mold’s life is turned upside down when Aggy is arrested, accused of poisoning the King with a special tonic. With no where else to turn, Mold must find a way to prove her innocence before it’s too late. But in a world filled with deadly baddies and hideous monsters how can he hope to succeed? Lorraine has created this truly believable world of magic and mayhem in Pellegarno. It is magical realism at it’s very best, making you feel totally involved in the story as you’re transported into the heart of this new land. She manages to bring it to life in the most unexpected ways primarily through Mold and his nose, who take us with him on an perilous journey allowing us to gain an true insight into the lives of the people. His amazing power of smell helps him to understand individuals true character which comes in very handy when he’s trying to distinguish good from evil as he tries to complete his dangerous mission. In the case of the dark and menancing baddie – who has got Aggy and Mold mixed up in this terrible plot – he has an overwhelming disgusting pong that reveals his true nature and this helps to warn Mold when he is nearby. Your senses are tantalised as Mold travels beyond the comfort of his home to an unknown city in search of the truth, uncovering secrets along the way. The characterisation in the story is just wonderful. Our young hero Mold is an unlikely but remarkable hero who has to face the most extreme adversity and trials to try and save Aggy from the hangman and his noose. Despite this he refuses to give up and his loyalty to her is wonderfully endearing and heart warming. Fergus has to be one of my most favourite characters, his unwavering enthusiasm – having found a friend in Mold – and determination to support him in his endeavours is just incredible. I just can’t resist a despicable baddie and Lorraine satisfies my appetite with some truly menacing and loathsome individuals who go to incredible lengths to upset Mold’s attempts to rescue Aggy. An exciting and vibrant story filled with twists, turns and drama at every turn. Just when you think you know what is going to happen next, Lorraine manages to surprise you with this remarkable plot. A wonderful tale about friendship, loyalty and learning to accept yourself for who you are, I absolutely loved it. Thank you to OUP for sending me a copy of this marvellous book. ‘Mold and the Posion Plot’ is released on May 4th and is available to pre-order from all good bookshops. This entry was posted in Uncategorized on March 18, 2017 by bookloverjo.